An article appeared over on the GOOD blog this week proclaiming backyard bunnies to be the next urban chickens, and it seems this proclamation has some resonance amongst the sustainability crowd, as it was tweeted and retweeted quite a bit over the last few days. Let me set this straight. Backyard Bunnies are NOT the next Urban Chickens for one simple reason: you don't kill your chicken at harvest time. Urban chickens will provide a regular supply of protein-packed eggs for at least three years (sometimes much longer) and there's no blood on your hands. Raising chickens means entering a nurturing relationship with an animal that rewards you sustainably and over time. Bunnies, on the other hand, only give up their protein once: and that's after the slaughter. And I'm not so sure mainstream America are ready to have a bunch of slaughter operations going on in the suburbs. (Heck, they're having a hard enough time with the chicken poop). Sure, there are many reasons why rabbits are, indeed a good source of meat, as the GOOD article details, but let's not get ahead of ourselves. If you want to know how difficult it is to kill a bunny, I recommend reading Farm City: The Education of an Urban Farmer by Novella Carpenter as she goes into great detail what it's like to move from raising fowl for eggs to fowl for slaughter to bunnies for meat. Of course, many of you may already be thinking about raising your chooks for eggs and meat and so the whole slaughter bit doesn't really bother you. I, on the other hand, see urban chickens as bug- and weed-eating sources of chicken manure and eggs. The thought of raising chickens for meat is beyond me, and I prefer to stay one step removed from that process for a good while now. What about you? Are you keeping your chickens for eggs or for meat or for both? How did you come to that decision? I loved reading Farm City and find it a source of inspiration for many things I do in my Ohio urban homestead. 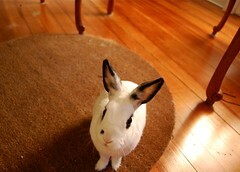 When considering what livestock to raise in our tiny backyard, we did think about rabbits. The high turnover of animals and the regular slaughter did not appeal. Instead we chose chickens who are more difficult to be permitted for in our city but should produce eggs for years. Our daughter delights in them and the garden will surely benefit from the composted waste. Rabbits are not a replacement for urban chickens, but only because (as Rachel's comment shows) meat rabbits and backyard chickens appeal to two entirely different groups of people. Most urbanites like chickens precisely because it provides food but doesn't involve slaughter. The chickens stick around as "food/pets". Rabbits, on the other hand, are a far superior choice for urban meat production than chickens, for many reasons. But since most backyard chicken keepers aren't looking for meat anyway, it's not a question of replacement. Different strokes, different folks. We raise our chickens for their eggs and for their friendship. We raise guinea fowl for their entertainment. We do not eat ANY of our pets. We raise our chickens for eggs, and then slaughter the hens after 3 years for stew meat. I also raise extra chickens every spring for meat only. And I'll start with rabbits once it's a bit warmer outside, too. And plan to learn to slaughter them myself. I don't view "work" animals as pets. I have animals as part of our urban homestead, as we move slowly but surely towards being self-sufficient. I am planning to raise for both. As Sarah said, they shouldn't be wasted once they are past egg production. Or if you end up with a surplus. Humans are omnivores. If we eat meat at all, we should be willing to do the dirty work for it. It is a bette life than living in a tiny cage in a commercial chicken house. Like the Indians, I believe the gift of an animal's life to sustain us is a part of the circle of life and I appreciate every one. I raised rabbits for my ag project in high school. They were precious. We ate them. I didn't kill them myself at the time, but I could now. I was a vegetarian for several years, but it just isn't good for my health. I have many pets, and had two pet chickens growing up. Sustainablility involves killing livestock. I kill fish too sometimes. Great to see such a diverse bunch of readers here! I have to admit I'm still a bit squeamish about killing my own meat source (it's something I'm going to have to get over). I still think the best way to get urban chickens legalized where they're currently not is via the "they're for eggs, not meat" route. Once we turn the corner on accepting egg-laying hens into all suburbs, then we can start talking about meat birds. I just started. We have six month-old chickens at the moment, for the eggs. That said, I plan on keeping chickens for meat as well as soon as we get the laying flock established. I went to a slaughter demonstration at Novella Carpenter's farm, as a matter of fact, to see if I could handle that, and then helped another local chicken person with her older birds. It isn't that I particularly like the idea or the process, but I am far less comfortable with eating meat that hasn't had a good life and a death as humane as it could be made. I can do that for birds I raise myself, and I think it's a lot more honest to take that on, since I don't intend to stop eating meat. Someone mentioned the fiber animal aspect - not everyone who's talking about backyard bunnies wants to eat them, some of 'em want to raise 'em for their fiber. So it doesn't necessarily involve slaughter. Just wanted to emphasize that point, even though I am not a bunny person and have a happy little egg production flock in my backyard. We raise rabbits (Dwarf Lionheads), chickens and goats on our 1/10th acre in downtown Ypsilanti. We do not eat the rabbits but sell them as pets. We also prize the rabbit manure for its fertilizing ability. We have neighbors who buy it from us because it is so rich in nutrients. We are currently down to about 16 rabbits, 4 goats, and 7 chickens. from a high of 60 rabbits, 45 chickens, and 8 goats who were generating a lot of manure, eggs, and milk a year ago. I am working on getting both hens and rabbits--but neither will be for meat. If I get bunnies they will be fibre producers.